Hurricane Irma swept over U.S. President Donald Trump’s 11-bedroom Caribbean mansion on Wednesday, the first of several luxury Trump properties threatened by the storm’s path. It was not immediately known whether Irma damaged Trump’s beachfront Chateau des Palmiers, or Castle of the Palms, on St. Martin. The gated estate, for sale for $16.9 million, is owned through a trust and had been rented out, U.S. media has reported. But French Interior Minister Gerard Collomb said some buildings had been destroyed and social media showed flooded roads and overturned cars on the island that is roughly divided between France and the Netherlands. The situation was being closely monitored on St. Martin and at a number of Trump properties in Florida, Trump Organization spokesperson Amanda Miller told Reuters in a statement. “Our teams at the Trump properties in Florida are taking all of the proper precautions and following local and Florida state advisories very closely to ensure that everyone is kept safe and secure,” Miller said. 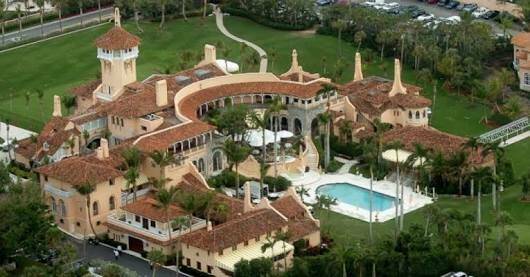 While Irma’s exact trajectory remained uncertain, Trump’s Mar-a-Lago estate in Palm Beach – which has been called the “winter White House” and valued by Forbes at $175 million – could also take a hit. Trump bought the estate in 1985 and turned it into an exclusive club, which now boasts a membership fee of $200,000. A staffer who answered the phone said it was closed and declined to comment further. Palm Beach County declared a state of emergency on Wednesday. Near Miami, Trump owns luxury high-rise condos called the Trump Towers, Sunny Isles and the oceanfront Trump International Beach Resort. Some guests were leaving ahead of the storm but precautions were being taken and resort officials were prepared to oversee evacuations if they were ordered, marketing director Jim Monastra said. At the Trump National Doral, an 800-acre golf resort in Miami that local media reported had completed a $250 million renovation last year, officials tweeted Wednesday that resort operations were going on as normal until further notice.